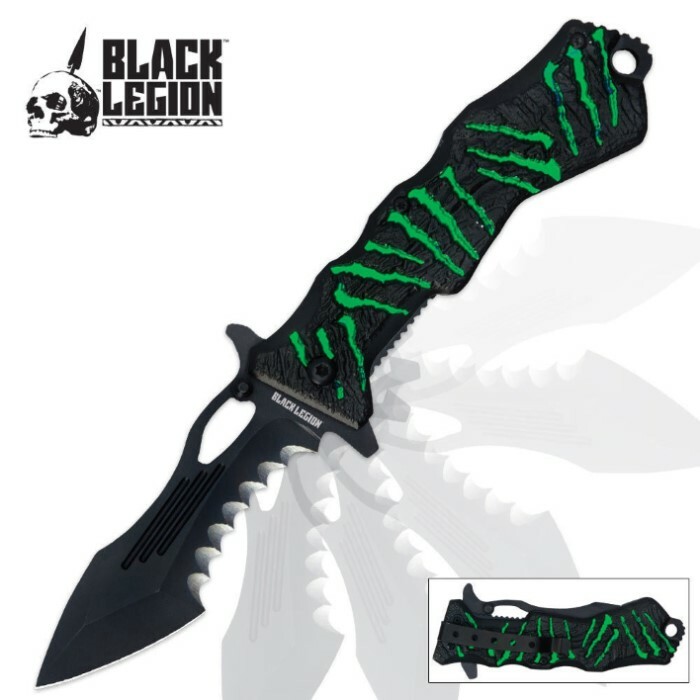 Black Legion Mutant Assisted Opening Knife | BUDK.com - Knives & Swords At The Lowest Prices! This Black Legion™ assisted open folder is sure to scare your opponent! It features a 3 1/2” 3Cr13 black-coated, stainless steel blade that opens almost effortlessly with the help of assisted open technology. The blade features three blood grooves, a blade cutout and serrations. The black and green aluminum handle features a mutant skin pattern that will make anyone squirm! I bought 3 of these knives for myself, my daughter and my mother. I really love them. They are sharp out of the box, and cool looking. I like the way it fits comfortably in my hand. One of the knives stopped 'clicking' into the fixed position after a few days, but, BUDK replaced it and I haven't had any other problems. I consider myself a connoisseur of knives and this one blew me away! Right from the get go, the look of this blade is stunning. Once you flip it open, the blade itself is even more impressive. I kid you not when I tell you that it is sharp enough almost to shave with! I would expect this knife to be sold for at least three times with what they are asking for. If you love blades or want to get someone who loves blades a gift, you cannot go wrong with this! I like this one! best opening one I own so far,worth it. The knife looks great and is sharp out the box. Best if used as a basic pocket knife. Wanted to use it at work to cut some poly and the holding screw came loose. Tighten it up and folded it. The screw popped out and now the knife is in two pieces. Guess it was just for show not for work. I received this knife as a Christmas gift and all I can say is WOW!! Wasn't expecting much with it being a ten dollar knife, but it is incredible. Came shaving sharp, feels incredibly sturdy, and has an amazing handle and blade design. Also much larger than it seems. Definitely recommend to anyone looking for a reliable assisted-open knife. When I ordered the knife was not expecting much for ten dollars. I was shocked at how solid the knife feels and has the fastest opening of all my knives. Fairly sharp out of the box but a little work on a good stone and it is razor sharp. This knife has the best assisted opening mechanism I have ever seen. It looks great, came decently sharp right out of the box, and the serrations are mean. I make and collect knives, and this is definitely a beast of a blade. I really like the textured handle, and the design is superb. Very well made knife. This has become my EDC protection knife. Nice looking,Opens Extremely easy,large sturdy pocket knife.has hole to attach cord for neck too.Indented teethlike cut in blade is very sharp too.impressed.Love it. This is a cool looking knife! The handle is fairly heavy and the green stripes are very bright (almost look like they're under a black light).the blade is sharp and has blood grooves to boot. Excellent quality!